Situated in large south facing gardens and conveniently located within 5 minutes drive of a bakers, grocers, post office, chemist, bars and restaurants. The local towns of Magnac Laval, Le Dorat, Bessines, Bellac and La Souterraine 10 -15 mins drive provides banks, hypermarkets, lots of shops, bars and restaurants. 15 minutes to the lakeside beaches of Lac de Saint Pardoux, 30 minutes to Limoges. Large living room with french doors, L-shaped sofa and 2 other sofas, coffee table, TV with freesat satellite UK channels and DVD player. Free broadband wifi internet. Large dining kitchen with french doors, base & wall units gas hob, electric oven, fridge/freezer microwave & dishwasher, solid oak sideboard and dining table, 10 dining chairs and highchair. Washing machine, exterior rotary clothes dryer, washing basket, ironing board and iron are provided. Outside: Private heated swimming pool with solar pool cover, electronic automatic pool safety alarm, Large pool side gazebo for shade and 8 sun lounger beds. Large dining table, 10 dining chairs, gazebo, outdoor sofa, 4 armchairs, parasol and Weber barbecue. Stone walls and conifer trees enclose private gardens with stone patios and grassed lawn areas and plenty of off street car parking. Description of Bathrooms: Bathroom 1 with with roll top bath, walk in shower, wc and twin wash basins. Bathroom 2 with walk in shower, wc and wash basin. Bathroom 3 with walk in shower, wc and wash basin. FREE POOL HEATING & WiFi INTERNET Large pool side gazebo for shade and 8 sun lounger beds. Outdoor dining table and 10 dining chairs, gazebo, outdoor sofa, 4 armchairs, parasol and Weber barbecue. Stone walls and conifer trees enclose private gardens with stone patios and grassed lawn areas and plenty of off street car parking. Rental Agreement: Security/Damage deposit: A fully refundable deposit of 500 euros to be paid on arrival and will be transferred back to your bank account, (less any breakages), within 7 days of your departure. All bed linen, duvets, pillows & inside towels are supplied. Please bring your own pool/outdoor towels. Arrival and departure cleaning is included and the Client agrees to be a considerate tenant and to take good care of the property and to leave the house and barbecue in a reasonably clean and tidy condition & to remove from the house all clients rubbish & foodstuffs & to return all kitchen items, inside & outside furniture to there original positions. Stayed in this wonderful house with extended family. Plenty of space for 10 with great outdoor spaces and lovely heated pool. A car is a must as most restaurants and shops are a few miles away. Would highly recommend this house and owner. Immaculate and perfectly equipped. Every detail of the house has been thought through and coordinated, and the owners have found just the right balance between leaving you to enjoy your holiday and being rapidly available to resolve issues. Peaceful, beautiful and luxurious! Thank you very much for your positive feedback, we are so glad you enjoyed the house and we hope you will return in the near future. We had a wonderful holiday at this beautiful, private villa. It has everything required in terms of modern conveniences of the highest quality and is in a lovely location. It is in the heart of authentic rural France, with one town or village more beautiful than the last. The pool was wonderful too. We highly recommend this property. Thank you much for your lovely comments and we very much hope you will return soon. We have had a wonderfull holiday in one of the most scenic parts of France. Beautiful accomodation, spacious and very clean and the large gardens and heated pool were great. All our needs were catered for and we would highly recommend the property and the area to family and friends. Thank you very much for taking the time to write such a wonderful review, we are so glad you had a good holiday and we hope to see you again. The farmhouse is lovely and very well equipped, the kids loved the heated pool and the large gardens were great, we had a very relaxing 2 weeks stay. There is a huge lake about 15 minutes drive with sailing, tennis courts and a beach, which was great fun for everyone. A special thank you to the caretaker. Many thanks for your kind review we are so happy you had a good time, hope to see you again. The nearby lively market town of Magnac Laval in the pretty Haute-Vienne countryside with a character filled old quarter, ancient houses, winding streets and a delightful riverside lined with attractive old buildings. The town has all the charm of rural France whilst providing all the facilities you could ever need including shops, supermarket, bars, restaurants, the town hosts a weekly traditional market on Thursday mornings if you like to do your shopping in true French style. Le Dorat has an important 12th century church in the Romanesque style, the Collegiale de St. Pierre and a fortified gate unique to the Limousin region it also has an outlet store for Limoges porcelain a wide range of shops, bars, restaurants superstores and of course a weekly market on Wednesday & Friday mornings..
Bessines Sur Gartempe is a pretty popular village with 5 restaurants, supermarkets, bakers, butchers, wine cellar, cafe's, florists, doctors, post office, banks, newsagents and markets on Thursday afternoon and Sunday mornings. Lake St. Pardoux - A20-15 minutes drive with 3 beach areas, surrounded by woodlands, ideal for mountain biking, horse riding, jogging, and walking. 330 hectares of lake where you can take part in a number of water sports - (water-skiing, wind-surfing, canoeing, pedalos, fishing, swimming or simply laying on the beach soaking up the sun. There are restaurants, tennis courts, children's play areas, water chutes, boating, water sports, horse-riding, fishing, bicycle & nature trails all on the doorstep. The nearest airport is Limoges 30mins away (from Stansted with Ryanair) https://flights.ryanair.com/en-gb/flights-to-limoges or from Southanpton with flybe https://www.flybe.com/cheap-flights/limoges/. The ferry port at Portsmouth with ferries to Cherbourg, Caen, Le Havre & St Malo with Brittany ferries http://www.brittanyferries.co.uk/ferry-routes/ferries-france/portsmouth-france. Distances from Caan 425 km, St Malo 447 km, Le Havre 522 km, Cherbourg 530 km and Calais 636 km. Limoges and its airport is about 30 mins drive away. Ryanair fly daily from London Stansted, Liverpool, East Midlands, Leeds/Bradford and Bristol and Flybe from Newcastle, Edinburgh, Belfast, Glasgow, Manchester, Guernsey, Jersey, Southampton etc. Calais is approximately 6 hours by car. The TGV fast train to Paris is 15 mins drive away. Car hire is available at the airport and through Ryanair. Use of a car is essential. 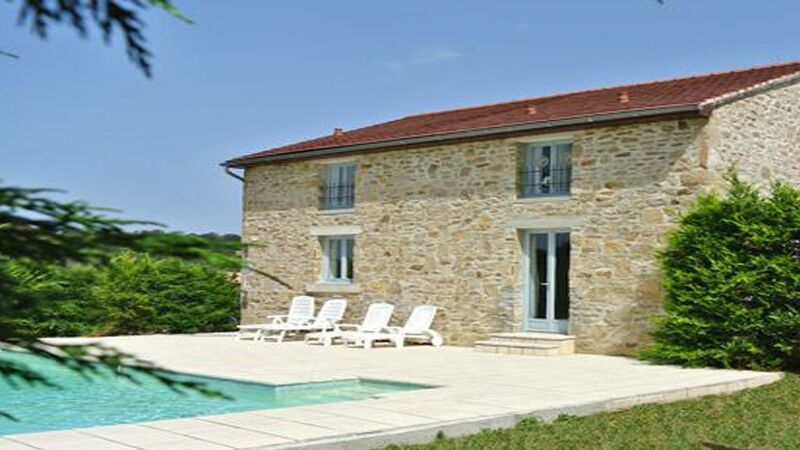 The local village just 5 mins drive provides a bakers, butchers, grocers, chemist, post office and 2 bars/restaurants The local towns of Magnac Laval, Le Dorat & Bessines Sur Gartempe are just 10-15 mins away and provide supermarkets, banks, shops, bars and restaurants. Larger hypermarkets, shops, bars, restaurants, train station are only 20 mins away in Bellac and La Souteraine. The medieval city of Limoges and its airport is just 30 mins by car. Limoges the capital city of the Limousin, with its museums, porcelain shops and factories, aquarium, botanical garden, the famous ‘rue de la boucherie, where several houses still have their 18th century shop fronts, market every day except Monday. Tarzan Park - Limoges- 20 mins - Lots of fun for the whole family, you can spend at least half a day climbing, crawling, hanging on to the ropes, you’ll certainly sleep well after this great day out. Park Zoo Reynou - A20-35 minutes Located in Le Vigen, south of Limoges, Reynou Park is a tourist and cultural place, where everybody will observe, understand and appreciate animal and vegetable kingdom. Montmorillion is a medieval town specialising in all crafts associated with books and publishing. Oradour sur Glane was a quiet dynamic village with a number of commerce’s until the horror of the 10th June 1944, the centre has been constructed in memory of what happened. FREE POOL HEATING & WiFi BROADBAND INTERNET Rental Agreement: Security/Damage deposit: A fully refundable deposit of 500 euros to be paid on arrival and will be transferred back to your bank account, (less any breakages), within 7 days of your departure. All bed linen, duvets, pillows & inside towels are supplied Please bring your own pool/outdoor towels. Arrival and departure cleaning is included and the Client agrees to be a considerate tenant and to take good care of the property and to leave the house and barbecue in a reasonably clean and tidy condition and to remove from the house all clients rubbish and foodstuffs and to return all kitchen items, inside and outside furniture to there original positions.. Check-in and check-out times: Arrival: 17.00, Departure: 10.00 Smoking: Smoking is not allowed inside. Swimming pool: The pool is heated from June-September. Pets: No pets allowed. Changeover day is Saturday CHAUFFAGE GRATUIT DE PISCINE ET INTERNET À LARGE BANDE DE WiFi Le nettoyage d'arrivée et de départ est inclus Tous les draps, couettes, oreillers et serviettes sont fournis S'il vous plaît apporter votre propre piscine / serviettes d'extérieur Le jour du changement est Samedi Un dépôt de garantie entièrement remboursable de 500 euros doit être payé à l'arrivée. Heures d'arrivée et de départ: Arrivée: 17h00, Départ: 10.00 Fumer: Il est interdit de fumer à l'intérieur. Piscine: La piscine est chauffée de juin à septembre.